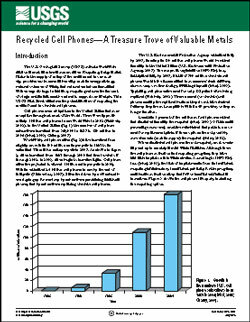 This U.S. Geological Survey (USGS) Fact Sheet examines the potential value of recycling the metals found in obsolete cell phones. Cell phones seem ubiquitous in the United States and commonplace throughout most of the world. There were approximately1 billion cell phones in use worldwide in 2002. In the United States, the number of cell phone subscribers increased from 340,000 in 1985 to 180 million in 2004. Worldwide, cell phone sales have increased from slightly more than 100 million units per year in 1997 to an estimated 779 million units per year in 2005. Cell phone sales are projected to exceed 1 billion units per year in 2009, with an estimated 2.6 billion cell phones in use by the end of that year. The U.S. Environmental Protection Agency estimated that, by 2005, as many as 130 million cell phones would be retired annually in the United States. The nonprofit organization INFORM, Inc., anticipated that, by 2005, a total of 500 million obsolete cell phones would have accumulated in consumers’ desk drawers, store rooms, or other storage, awaiting disposal. Typically, cell phones are used for only 1½ years before being replaced. Less than 1 percent of the millions of cell phones retired and discarded annually are recycled. When large numbers of cell phones become obsolete, large quantities of valuable metals end up either in storage or in landfills. The amount of metals potentially recoverable would make a significant addition to total metals recovered from recycling in the United States and would supplement virgin metals derived from mining.